This is the assurance given by the Director of DIPCON Engineering, Ian Singh, when he spoke to Searchlight earlier this week. Singh was responding to concerns raised by residents of Orange Hill and other communities north of the Rabacca Dry River. Last week Thursday, for the third time in about seven weeks, vehicular traffic was obstructed for almost an entire day, when makeshift roads in the Orange Hill area were destroyed. The makeshift road in the area of the Karo River washed away under the force of gushing waters that flowed through the river, as a result of days of torrential rains. The temporary road, which was expected to facilitate vehicular traffic until the bridge that is under construction is completed, is made from base material, which could not withstand the pressure of the forceful flow of water. This is the same type of bypass road that washed away at the now completed Warabishi River bridge in October. âThey built a very stupid bypass road. They could have done better than that,â said Sandy Bay resident Crispin Daniel, last Thursday. As he watched persons of all ages, including the very young, maneuver their way across a coconut tree trunk, with a rope to hold on to for balance Thursday afternoon, Daniel said that more thought should have been put into the temporary roads so as to ensure that regular movement isnât inhibited. He was, however, quick to say that their complaining isnât a sign of ingratitude, adding that the residents are happy for the road development taking place. A veritable balancing act! This student treads his way gingerly across the makeshift bridge to get home, with a pre-schooler in his arms. His sentiment was shared by another Sandy Bay resident, Winnifred Ballantyne, who told SEARCHLIGHT that it should have been clear that the bypass roads were inadequate. However, Singh told SEARCHLIGHT that his company wasnât pleased with the disruption that was caused by the bypass roads being washed away. He said that is why they will be making the bypass roads stronger. 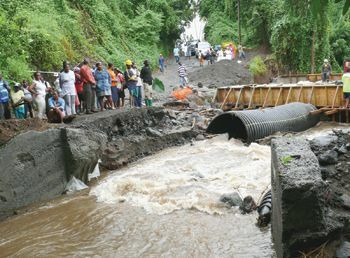 He, however, lamented that by the time the bypass roads are strengthened, he believes that the major rainfall will be over, and they wonât be under threat of washing away. It took much courage, but they got home, cautiously making their way across the water on a coconut tree trunk and with some rope for support. Because of the heavy November rainfall, the bridge at Karo, which had been scheduled to be completed by December 22, is now earmarked for completion in February 2009.